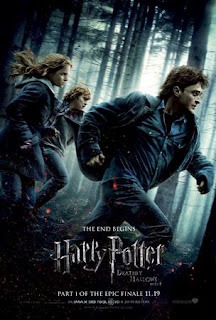 Harry Potter and the Deathly Hallows: Part 1 Movie! Well, you guys…it is almost here! The movie premiere of the first half of the Deathly Hallows is less than two weeks away. What are your plans? Are you going to a midnight release party, or maybe just plan on going sometime the first week or so it’s out? Maybe if you are a strange specimen of human being you don’t plan on seeing it at all? Let me know, I’m curious what everyone plans on doing! I’ve been to the past 3 movie midnight releases, but I haven’t made a huge party out of it since the Goblet of Fire. I have my ticket reserved for this movie as well, but I’m not sure what my exact plans are yet. Here are a couple of pictures of my friends and I from the Goblet of Fire movie release day! I am crazy excited!!! It's going to be awesome! My friends and I are going to see it on the second day it comes out. And what's even more amazing is that Suzanne Collins is going to come for a signing at the same mall that we'll be watching Harry Potter so we're going to attend that as well. I can't even fathom how mindblasting that is!!! It's going to be one of the best days of my life, hands down ! Exciting!! I bought VIP tickets for my Mom and I after she's done work on the 19th… that way we have reserved seats and won't have to line up for hours. My friends and I were planning on going at 12:00am but we had ticket issues and now are going at 3:30am. We consider that pretty strong devotion lol. We want to dress up but not sure yet. I'm soooooo excited though. I've already got my ticket and I'll definitely be dressing up! I can't wait!!! I have got my tickets for both the midnight release and then to see it again with the family on that Sunday. I always see it twice opening weekend! You guys did it right, those pictures came out great!